This post is sponsored by Pampered Chef, however all opinions are 100% my own. I partnered with Pampered Chef last weekend and had a bunch of my favorite girlfriends over to my house for a Pampered Chef party. We had an absolute blast and ate way too much food! 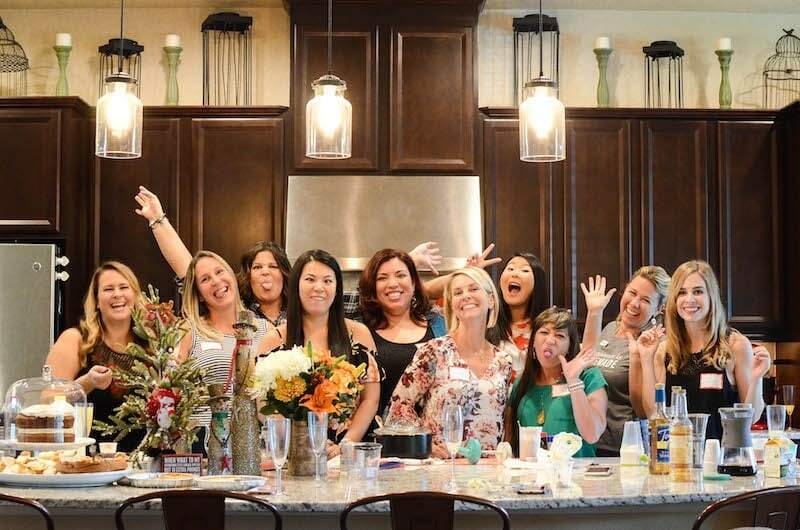 This was my first ever Pampered Chef party and I was pleasantly surprised to find out how easy it was to host. Besides making sure my house was clean and putting out a few snacks, I didn’t have to do much else. 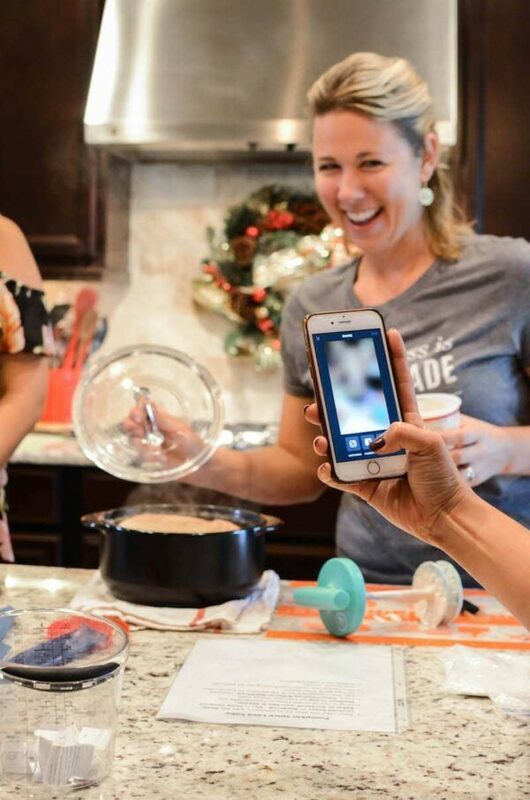 I found my consultant, Danielle, though the Pampered Chef’s website at its host a party page. From there, I reached out to Danielle and she took over everything. She sent me invites, planned a menu, brought everything the day of and helped clean! It was SO easy for me to host! 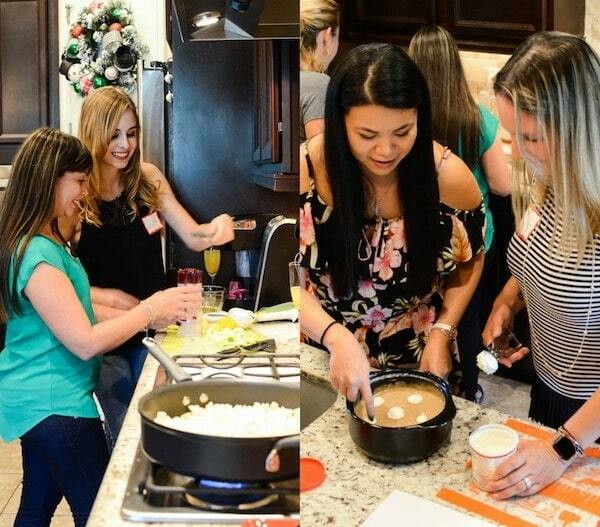 Pampered Chef parties are very hands-on these days and it is a great way to see which products you like. The consultant brings over all the tools you need, sets them up in stations and everyone gets to work together and try out the products. 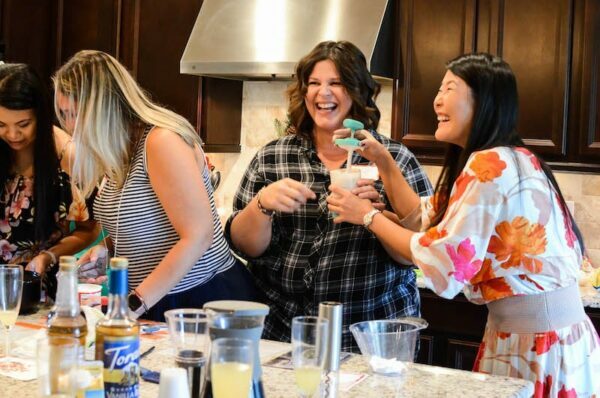 Out of all the tools, we were all in love with Pampered Chef’s new whipped cream maker. Since we are all big dessert fans, we were excited to learn to make whipped cream in 30 seconds. It is also perfect for fancy coffees, Jorge was really excited when ours arrived. Since the party was on Saturday at 11am, we had a Brunch and Brew theme. We had cold brew coffee, mimosas, pumpkin dream cake and a big cheese and charcuterie board. and mini cake box set) made the baking super easy. I made the bundts the day before with the mini fluted cake pan and boxed them up in these adorable little mini cake boxes. They were such a hit, that I went ahead and packaged up another set on Monday and sent them to school with the girls. I let the girls help bake them and sign the little labels for their teachers. It was a great way to spread the love for the holidays. Gotta love those #LittleWins! 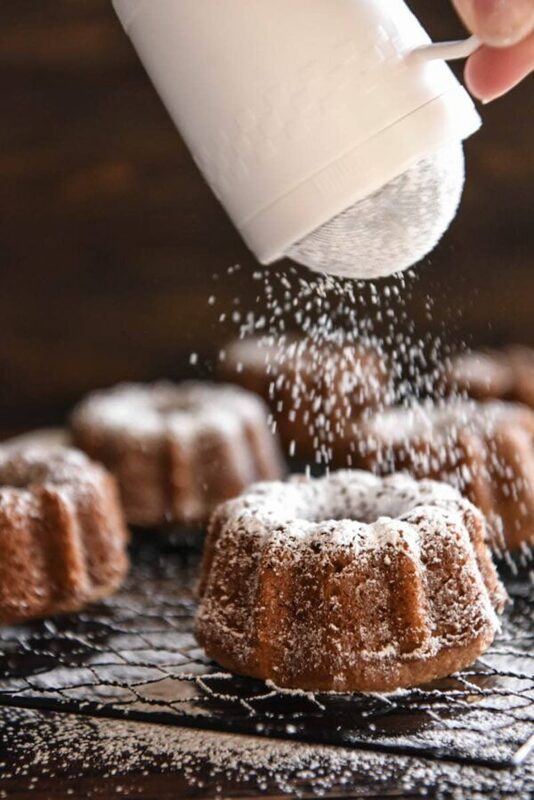 the flour & sugar shaker, but you could also dress them up with a cream cheese drizzle if you wanted to! They are the perfect sweet dessert, or as a breakfast/brunch treat with a cup of coffee. I hope you enjoy them as much as we all did! Preheat oven to 325°F. 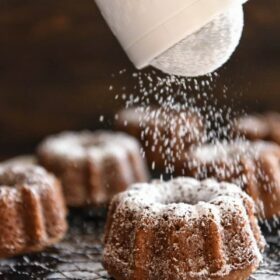 Grease mini bundt cake pan(s). Set aside. In a large bowl/stand mixer, cream butter and sugar until light and fluffy. Beat in the eggs one at a time, then stir in vanilla, pumpkin and vegetable oil. Beat in the flour mixture alternately with the milk. Divide batter evenly into prepared pan, till each bundt pan is 3/4 full. Bake for 20 to 22 minutes, or until a toothpick inserted into the cake comes out clean. Let cool for 10 minutes and invert onto a cooling rack/tray. Serve warm or room temperature, dusted with powdered sugar. **This post is sponsored by Pampered Chef, however all opinions are 100% my own. What a fun time! I love your theme and those mini bundt cakes are the cutest!! That looks like so much fun! And these bundt cakes are adorable! Looks like a great time! 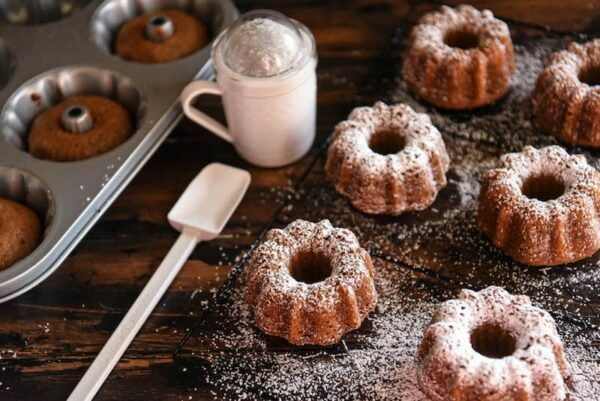 And the pumpkin bundt cake looks delicious! 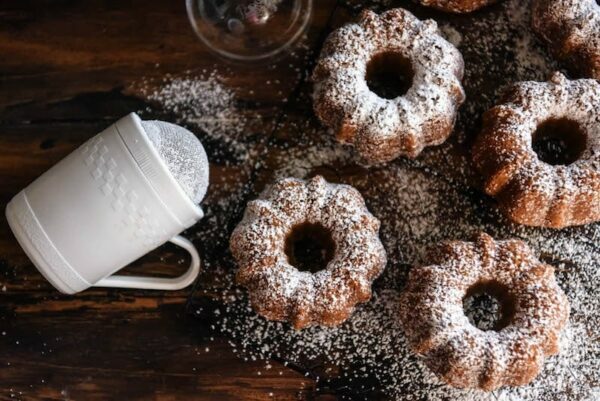 These bundt cakes look delicious! I would love to make them for holidays! What a fun time! 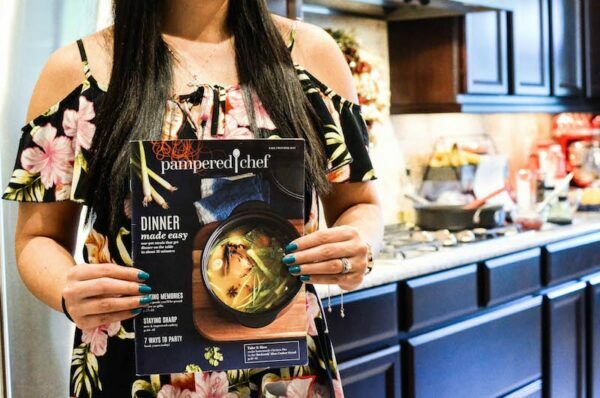 Some of my favorite kitchen tools are Pampered Chef! Loving the mini bundts – they’re so pretty! Wow, these cakes look so yummy and I never make cakes by myseelf, but this time I decide to have a try. Thanks for sharing the recipe! Jessica, I had a GREAT TIME!!! You were such a great host to work with and I’m so glad you found ME through the Find a Consultant!! Such a great group of friends and soooo many laughs! very good flavor. delicious! would love to make them for holidays!